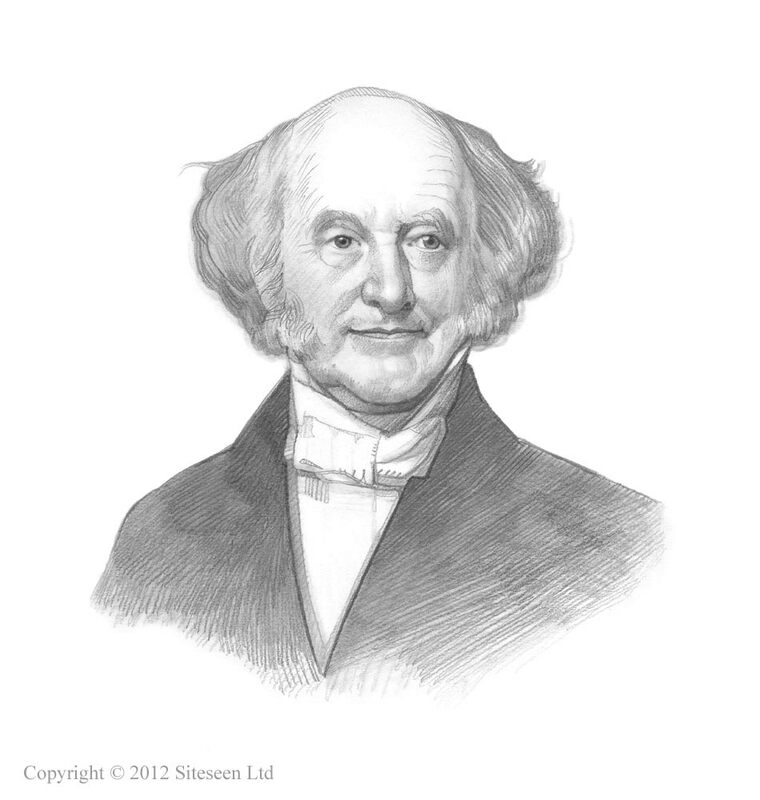 Samuel Morse and the First Telegraph: Martin Van Buren was the 8th American President who served in office from March 4, 1837 to March 4, 1841. One of the important events during his presidency was the invention of the Morse Code and the first telegraph line. The non electric telegraph was invented by Claude Chappe in 1794 using a visual system called semaphore (a flag-based alphabet) that depended on a line of sight for communication. Cooke and Wheatstone were the first to introduce a telegraph worked by electro-magnetism; but it not able to mark down the message. Samuel Morse (1791-1872) was the first to successfully exploit the electro-magnet and developed and patented the first electrical telegraph in the United States in 1837. Samuel Morse and his assistant, Alfred Vail (1807-1859), developed the Morse code alphabet. The telegraph is an electromagnet connected to a battery via a switch. A telegraph system transmits signals by using an electrical device that consists of a machine to send signals by a wire to a receiving machine. The signals are sent by a code to represent the alphabet and numbers. The problem with the electric telegraph was that an electric current could be arranged in only two ways. The electric current is either flowing and it is “On,” or the current is not flowing and it is "Off". Samuel Morse found a way to use the flow of electric current to make a code that could be sent along the wires. Samuel Morse discovered that if a man at one end of a line of wire pressed down a key (the sender), electricity could be made at the same moment to automatically press down another key at the other end of the line of wire and marked by the receiving machine on a moving strip of paper. He invented the Morse Key that could create short and long bursts of electric current (called pulses) using long or short taps on the Morse key machine. Samuel Morse discovered that the receiving machine at the farther end of the line could be so arranged as to make an impression on a piece of paper that was slowly drawn under it by clockwork. He then had to work out a way that the impression could convey a message - he succeeded and this invention would be called the Morse Code. The Morse telegraph system was basically an electrical circuit consisting of 3 parts all linked together by a wire. The battery supplied the voltage, the Morse Key completed, or broke, the electric circuit and the electromagnet for the 'sounder'. The first telegram in the United States was sent by Samuel Morse on 11 January 1838, across two miles (3 km) of wire at Speedwell Ironworks near Morristown, New Jersey. The message read "A patient waiter is no loser." The Speedwell Iron Works was owned by Alfred Vail's father who had given financial backing to the inventors. Samuel Morse demonstrated his telegraph system to a somewhat skeptical Congress. He sent telegraph messages between the Senate and House and finally in 1843 he managed to convince Congress to fund $10,000 for the construction of the first telegraph line in the United States. The first telegraph line ran for 30 miles from Washington, D.C., to Baltimore, Maryland. The Morse Code is also referred to as the Railroad Morse. His 'land-line' telegraphic communication system carried signals across the land by lines (wires) supported by telegraph poles. The land-line telegraph system used "sounders" to allow the receiving operator to "hear" the clicking sounds of the Morse code and to translate them into letters. Telegraph poles were erected alongside the railroad from Washington to Baltimore. This made perfect sense as the route had already been cleared due to the construction of the railroad and it was easy to set up poles to carry the telegraph wires. It is fortunate that the development of the telegraph coincided with the establishment of the American railroads - refer to Railroads in the 1800s for facts and information. Provisions in the Pacific Railroad Acts were made for the telegraph companies, who had just completed the First Transcontinental Telegraph in 1861, to combine their lines with the telegraph lines of the Transcontinental Railroad as they were built. First Telegraph: "What hath God wrought"
Following the construction of the first long distance telegraph line Samuel Morse installed a telegraph key in the Supreme Court chamber and invited members of Congress to witness the event. A young woman called Annie Ellsworth provided the first message to be sent. The famous message was "What hath God wrought" and were taken from the Bible (Numbers 23:23). Annie Ellsworth's father was Henry Leavitt Ellsworth, the U.S. Patent Commissioner, who had championed Samuel Morse’s invention and helped secure funding for it. The first message was sent by Samuel Morse in Washington on May 24, 1844 to Alfred Vail at the Baltimore and Ohio Railroad "outer depot" in Baltimore, Maryland. Alfred Vail in Baltimore then asked: "What is the news from Washington?" Samuel Morse then telegraphed political news from the capital which were published as telegraphic dispatches in Baltimore newspapers. The invention of the telegraph was one of the most significant events in the history of the United States and revolutionized communication throughout the world. The Morse Code enabled messages to be communicated at the rate of ten words every minute.